While The Rolling Stones may have been the big (false) rumor for Coachella this year, Keith Richards and company were snagged by the famed British festival across the pond. Amazingly, it will be the first time the band has headlined England's biggest music fest, and we couldn't think of a better act to top the bill. Jagger even went on Twitter to joke about the event's famously marshy environment, telling fans, "Can't wait to play Glastonbury. I have my wellies and my yurt." This goes to show us that the only guy who has moves like Jagger is Jagger himself. Alongside The Rolling Stones, the lineup is a typically eclectic band blowout with folksy beardos Mumford & Sons, indie rockers Arctic Monkeys and Vampire Weekend, trip-hoppers Portishead, old punkers Elvis Costello and Nick Cave & The Bad Seeds, and a fair amount of solid hip-hop acts (we're looking at you Earl Sweatshirt). They even snagged R&B crooner The Weeknd. If the festival organizer's goal was to please everyone, they did a pretty good job. If you're one of the people who helped sell out the festival last October, it seems like you made the right decision. 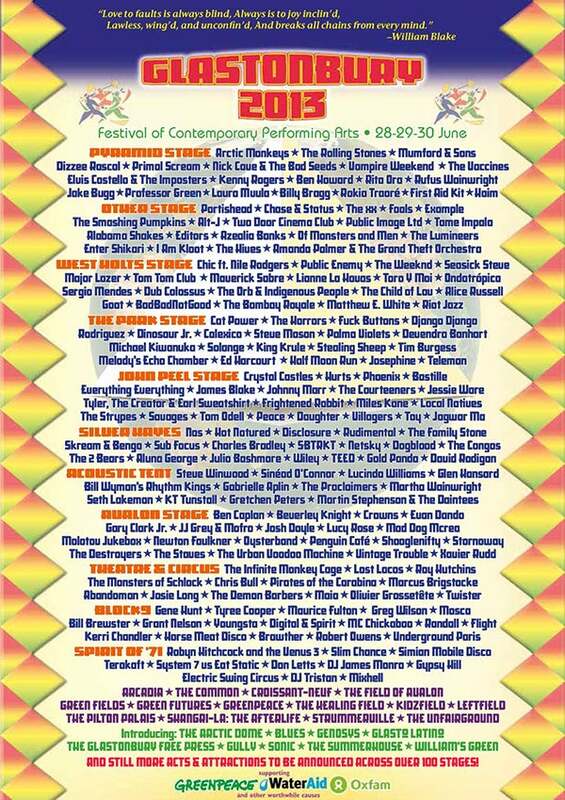 Check out the full lineup from the Glastonbury flyer above, and mark your calendars for June 28 through 30.